Prisoner’s dilemma – Patrick F. Clarkin, Ph.D. 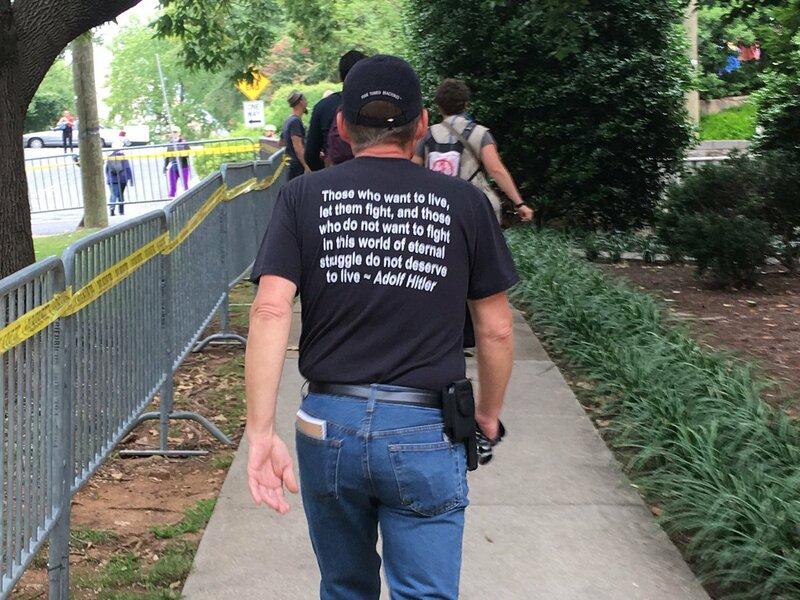 I saw this photo of a man wearing a shirt quoting Hitler during the violent protests in Charlottesville. I thought about ignoring it, but I’m not merely concerned about this one man’s shirt. Aside from the repulsion from seeing someone walking down a public street supporting Hitler, the thought that people see life as eternal struggle is disturbing. I also think it’s very poor science. If you read the passage where this quote originated (and I’m not recommending you do that), Hitler was appealing to biology, claiming his argument was based in “the most patent principles of Nature’s rule” and “the iron logic of Nature.” Although at one point he also wrote that racial separation was “the will of the eternal creator,” so this seems to be a throwback to a confused, 18th century deistic view of Nature with a big “N” meant to reinforce his own biases. So here it is in 2017, and some people are still leaning on what a genocidal dictator wrote in the 1920s. Somewhere, we’ve gotten off track. As we’ll see, conflict is not inevitable. In fact, in many ways, “iron logic” suggests that cooperation makes far more sense. First, I’m going to try to tie this together by starting off with a quick story. Please bear with me. In one of my classes, we play a game known as the Prisoner’s Dilemma. It’s a fun exercise, where students earn ‘points’ by choosing either to cooperate with, or defect on, a partner. We do a few different versions of the game, sometimes with randomly assigned partners for a single round, sometimes with the same partner for multiple rounds, and with different point structures. We also use a deck of playing cards, where students choose a red card to signify defection or a black card for cooperation. All interactions are face-to-face, in real time, and as an incentive there is a prize for the two people who receive the most points. In the game, two people who committed a crime are arrested and each is placed in solitary confinement for interrogation. If one betrays the other, the first goes free while the second is sentenced to three years in prison. If they both betray one another, they each receive two years. But if they both keep silent, they receive the minimum penalty of one year each. Under this scenario, the best individual strategy would be to betray the other. In our classroom exercise, we invert the scenario and give positive rewards for cooperating (points), since I’m not authorized to give out negative penalties for defecting like years in prison (not that I’d want to do that, anyway).